Maybe it’s because my first measurement of my common sense came from a personality test designed to evaluate my sales capabilities and it exposed me as being naive. Naiveté is the exact description for what I had in their test. 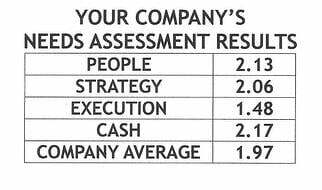 In the Objective Management Group of Sales Evaluations we use today (much more scientific) this measurement might have been classified as being too trusting of clients (believe prospects are honest) or not asking hard questions, which is a Hidden Weakness for Record Collection and Emotional Involvement. So when Aubrey Daniels in Bringing Out the Best in People states, “contrary to popular belief there isn’t too little common sense in business, there’s too much.” I listen. The very definition of common sense should make you stand up and take notice. Webster defines common sense as “the unreflective opinions of ordinary people.” Unreflective opinions are based on unanalyzed experience. Organizations cannot live with management strategies based on the unreflective opinions of its managers and leaders. So what and how should management respond? Common sense knowledge is acquired in ordinary business and living while scientific knowledge must be pursued deliberately and systematically. Common sense is plentiful, in fact it takes no special effort to acquire it. All of us have opinions, many of them unreflective. Scientific knowledge requires a special effort to acquire it. Common sense knowledge is individual; scientific knowledge is universal. Daniels points out that common sense isn’t common at all, its individual, drawn from personal experience. When someone may ask you, “Why didn’t you use your common sense?” in actuality they are really asking you, “Why didn’t you do what I would have done?” When you use common sense you always do what makes sense to you. Scientific knowledge goes beyond the individual to look for that which is applicable across all situations. Common sense knowledge accepts the obvious; scientific knowledge questions the obvious. Common sense says, “of course” scientific knowledge asks, “Why?” Common sense once told us many things we’ve discovered are not true today. The earth is flat as an example. A scientist begins his search for the truth with the common sense answer. Common sense always has an answer. Common sense knowledge is vague; scientific knowledge is precise. I like Daniels comparison here to a sports game. I’ve longed agreed with him that when a team wins or a player performs better and a sports announcer will frequently say, “He just wanted it more.” How do you know that exactly, and how do you help the other player who didn’t perform to improve for next time with an answer like this. Post-game we know there are reasons behind any individual or team performance that provided the motivation. Scientific knowledge would want to know precisely what actions the coach can take to create outstanding performance in those athletes regardless. Common sense cannot be counted on to produce consistent results; application of scientific knowledge yields the same results every time. This is the most compelling reason to abandon common sense and seek scientific knowledge to solving human performance in the workplace. Without scientific knowledge many a business leader has accepted a practice from another industry to use in his business even though the only support is common sense. Business leaders today need to know that the practices they are using to improve workplace performance work consistently and predictably. It’s a good reason to consider having a Gazelles coach and attending conferences like the Phoenix Growth Summit in October to ensure you are receiving unvarnished proven methods of improving your workplace performance. Common Sense is gained through uncontrolled experience; scientific knowledge is gained through controlled experiment. Many business people look at this and simply give up. Scientific knowledge they feel is too long, hard, and painful for a small to mid-sized business to undertake. Instead they flip from one method to the next never achieving the success they would have if only they measured and controlled the processes. If you’re business is operating under the common sense approach to management I hope this gives you pause to how you should be conducting your management team. As long as we’re on positive reinforcement let’s stay here next blog and discuss the verbal eraser that destroys good intentions. I’ll bet you and your managers are guilty of using this and unaware how it impacts work performance.